So it was with great sadness that I bid farewell to Playstation One, Nintendo GameCube and Nintendo 64. The first two are already sold, I put on "Buy It Now" listings and they went like hotcakes. I have to be honest, I am still in two minds about the Nintendo 64 having spent an hour playing Perfect Dark. Sure, it's graphics aren't that impressive by modern standards and the gameplay isn't that smooth (even though it uses the Goldeneye game engine) - but it still brings back great gaming memories for me. It also boasts one of the most impressive soundtracks that I've heard - sounding like a mix of Blade Runneresque Hip Hop and high octane movie music. Sad as I am, I did download the full album and I'm listening to it now. Oh dear. 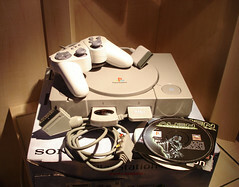 I never bonded that well with the Playstation but it's the only ever machine I've had chipped and had copied games for. I enjoyed GTA on it and Aliens ("Play with the lights turned down!") but I just never spent enough time on it. 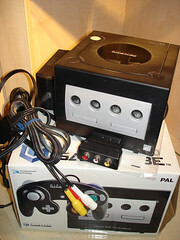 The Gamecube was a great little machine and luckily my Wii is backward compatible so I can play my favourites on that. The N64 I own still has Perfect Dark which I've mentioned and Beetle Adventure Racing (a great VW game that I enjoyed) and Lylat Wars - a StarFox game. 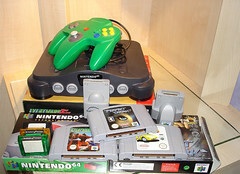 I may end up removing that auction - the strange thing is that an N64 seems to sell for a price double that of the PSone and Gamecube - not bad for a console first released in the UK in March 1997. How much did you sell em for mate? I've got one of each n'all. Gamecube (without controller) was only £5 and the Playstation £10. There's no value to them - seems to be more value to Snes and N64 hardware! I kind of regret getting rid of my N64 when I did - I'd probably still be goofing around on ISS and Super Mario today if I still had it. I used to love it on ISS when you were thrashing somebody and the commentator would say "The defence are in tatters"
I've still got the SNES (don't let Elaine know), although I did flog most of the games a few years back, and like you say, there's hardly any point flogging the gamecube is it ! I'm so sad, I've got a Wii sitting there with Mario Galaxy and Star Wars Lego and I've been playing Perfect Dark and Lylat Wars. The Snes and Street Fighter... what memories. My first console - purchased for £130 (would that be right?) in Woolworths in Bromley, Kent. Such great games as well having only had a BBC B before! My Snes still sits in my loft. I flogged all the games off years ago, but for some reason I still have Judge Dredd.